Q: How does our whey compare to others on the market? A: Proserum is produced as the finest native whey protein on the market. It is minimally processed to best maintain the full range of biologically active, undenatured, natural whey protein components. The milk is derived from cows that are grass-fed and graze year-round on natural pastures. It is GMO-free, hormone-treatment-free, pesticide and chemical-free and undergoes minimal processing. The vast majority of milk is from grain-fed cows, which has been shown to be of inferior quality to grass fed cows. 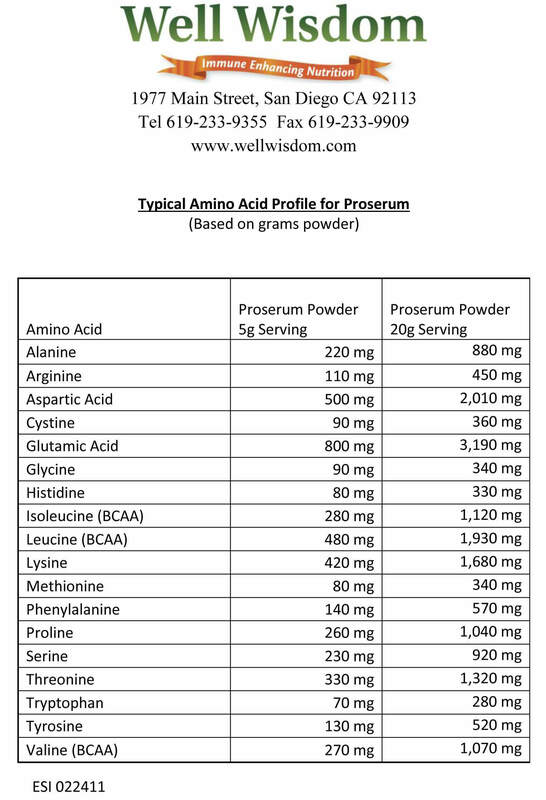 Proserum whey product is derived from cows that graze year-round on chemical and pesticide natural pastures. Organic is not a helpful standard to look for because many organic dairies use or supplement with grain during the year. Proserum® utilizes a proprietary filtration and drying method that involves a minimal amount of processing. The result is a microbial safe product that exceeds all standards and makes it the optimum nutrition whey powder. We DO NOT use cross-flow filtration, microfiltration, isolate filtration, hydrolyzation or ion exchange because these methods denature (damage) the original protein components. After use of these commercial methods, the damaged proteins are then filtered out and what remains is a narrow range of “undenatured” proteins that have survived the whey manufacturing process. Additionally the vital protein-bound fats have been removed. When considering a whey product it is best to ask for a lab analysis of the whey showing actual percentages of components present from the distributor/manufacturer. You should not receive a range of percentages as that denotes it is not from an actual test. Test results on our products are from an independent lab that performs SDS PAGE Gel method testing. Proserum® contains generous amounts of the crucial glutathione precursor covalent-bonded Cysteine. It is the optimal component for the intracellular production of Glutathione (GSH). Cysteine is very scarce in our modern diet and therefore Glutathione production is limited and deficiency is prevalent. Additionally lung, liver and digestive abnormalities, pharmaceutical drugs and most stressors lower Glutathione levels. 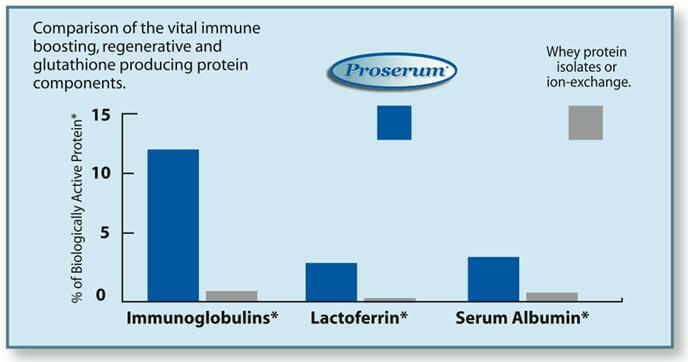 Proserum also contains the full range and highest levels of the most important protein components: Lactoferrin, Immunoglobulins, Serum Albumin, Active Peptides and Growth Factors. All these support proper immune function. *Based on analysis of protein as determined by an independent laboratory using the SDS PAGE Gel method. This is the industry accepted method to determine the actual biological activity of a milk protein. 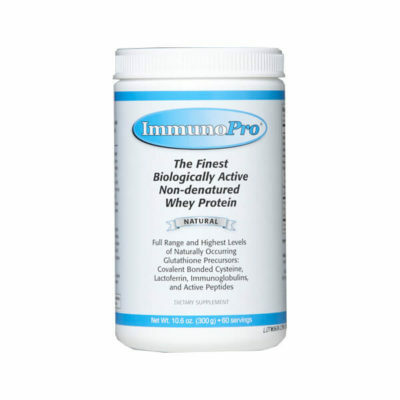 A: ImmunoPro and Vital Whey are all made with Proserum, the finest natural whey protein available. The key differences between these products are the suggested serving size and the addition of flavoring to Vital Whey. Vital Whey Natural Cocoa and Natural Vanilla use stevia, an all-natural non-caloric sweetener and natural vanilla or cocoa depending on the flavor. They also contain gum acacia, a natural plant extract used to add texture. Q: Is the Well Wisdom whey a raw product? A. Per the FDA, all powdered dairy products in commerce are legally required to undergo pasteurization in order to be sold. The Proserum in our products is minimally processed using a single pasteurization and is dried using ambient air temperature. However, because we use the highest quality milk from grass-fed year-round cows and minimal heat, our Proserum is able to best maintain the full range of biologically active protein components in their native forms. Q: Is Proserum a whey protein concentrate or isolate? A. Our Proserum native whey is classified as a natural whey protein concentrate meaning that it has a protein value of approximately 80%. We do not use the additional processing steps necessary to change our whey to an isolate which have an artificially increased protein content of 90% or higher. This additional processing denatures the fragile protein components that have made Proserum the standard when looking for high quality non-denatured whey protein powder. Q: Is our whey organic? A: While not certified organic, Proserum has all the advantages of natural pastures. The milk for Proserum is derived from cows that are grass-fed and graze year-round on natural pastures. It is GMO-free, hormone-treatment-free, pesticide and chemical-free and undergoes minimal processing. Q: What about other whey products that claim to use no heat whatsoever and instead use a process of “cold pasteurization”? Q: Can liquid nitrogen be used to pasteurize milk? Q: What is the lactose content in the whey? What is the casein content? A. Lactose content for the Proserum is 1 g per 10 gram serving, which is considered below the level for people who are lactose intolerant. All whey and colostrum products contain varying amounts of casein. Lab analysis of our native whey protein verifies that our whey contains less than 1% non-denatured casein. Q: Do Well Wisdom products contain gluten? 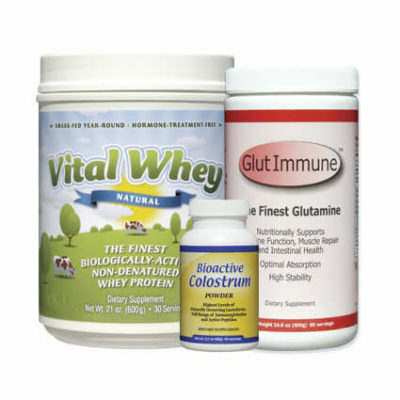 A: All of our ImmunoPro, Vital Whey and Bioactive Colostrum products are gluten free. 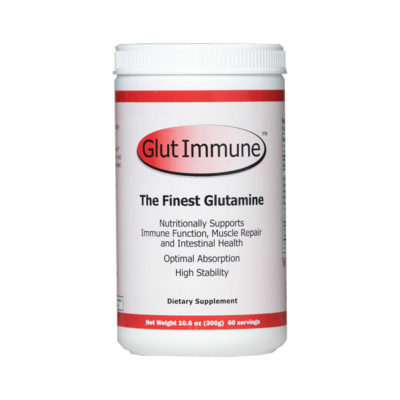 Our Glut Immune™ product is enzymatically derived from red wheat berries and is approximately 14% gluten. Individuals with known gluten intolerance should take this into account when considering this product. Q: What is the best storage method? (Refrigerator vs. not, etc.) What is the shelf life? A: The best method of storage is in a cool, dry location with the cap on the jar. Refrigeration should avoided when possible to limit the whey’s exposure to ambient moisture. Well Wisdom whey products have a 2 year shelf life from the manufacture date listed on the jar. Q: How should each product be taken and how many servings per day? A: For optimal uptake it is recommended that any products containing our Proserum® native whey protein are taken at least 15 minutes before consuming solid foods. Click HERE for more info. Q: What is the typical amino acid profile of Proserum native whey protein concentrate? ImmunoPro or Vital Whey may be placed directly in the mouth in small amounts (e.g. 1/2 teaspoon) as often as desired. Chew slowly. They may also be mixed hand mixed in liquids. Add the powder slowly to the liquid as you are stirring with a fork. You may use in water, raw milk or milk substitute (e.g. almond or rice milk) in an amount to satisfy your taste. A shaker jar is recommended. Use of an electric blender is acceptable on low speed. If possible drink slowly and circulate in the mouth before swallowing. This insures the uptake of the native protein peptides. Important note: Liquids should be cold or room temperature. Do not use hot liquids because high temperature will denature* (damage) the fragile proteins. pH change is also damaging. Mixing the whey powder with any other types of food can induce a pH change and slow the transit time in the stomach through its digestive response to the solid food. Liquids that are not neutral in their pH can denature the proteins, so avoid mixing with fruit juices, coffee, and tea. By following the above guide the uptake of the proteins in their native form in the upper small intestine is optimized. The addition of a sweetener or flavoring for palatability with our products is acceptable. These three products are exceptionally potent in immune and regenerative components and will greatly enhance any protein supplement one is already consuming. GlutImmune™ may be mixed with our whey products. Serving size and frequency: If you are unaccustomed to these products, and there is a possibility you may be sensitive, we suggest that you begin with one measuring teaspoon (approx. 1.5 grams) or less and increase gradually to avoid possible uncomfortable responses. Regular serving size can vary greatly between individuals. Many use one or more servings, one or more times per day. It’s best to take these whey products on an empty stomach and refrain from eating for 15 minutes. Note on allergies and sensitivities: If one has a true milk allergy, all dairy products need to be avoided. People with this condition should be aware of it. Intolerance to milk products and dairy proteins that are damaged from pasteurization and processing is far more common. Wellwisdom’ Proserum native whey powder is not subject to any production methods that would damage the full range of proteins. Lactose content in these whey products is 0.5g per 5 grams which is well below the level for intolerance. If bloating occurs, it can be helpful to place 1/2 teaspoon of whey powder in the mouth and let it dissolve by chewing slowly. Alternating days of use for sensitive individuals and consulting with your health care professional regarding serving size can also be helpful. Do you have a lab report to show the profile of the Native whey protein. I have been using it, but without that report I am “shooting in the dark” within the context of your articles. Also this whey is made what is left behind cheese making. I was looking for a whey made directly made from milk. Not left overs.